A true, full-length open-world game for PSVR, Skyrim®VR reimagines the complete epic fantasy masterpiece with an unparalleled sense of scale, depth, and immersion. Winner of more than 200 Game of the Year awards, Skyrim®VR includes the critically-acclaimed core game and all official add-ons – Dawnguard, Hearthfire, and Dragonborn. This bundle will vault you into the world of Skyrim in virtual reality, including a PlayStation®VR headset, PlayStation®Camera, two PlayStation®Move controllers, and the Skyrim®VR game. From battling ancient dragons to exploring rugged mountains and more, Skyrim®VR brings to life a complete open world for you to experience any way you choose. Skyrim® VR can be played with either a DUALSHOCK 4 controller or the PlayStation Move Motion controllers. To heighten your experience, each controller also enables you to customize your movement with both free movement and teleportation options. A PS4™ system (sold separately) is required to use PSVR. 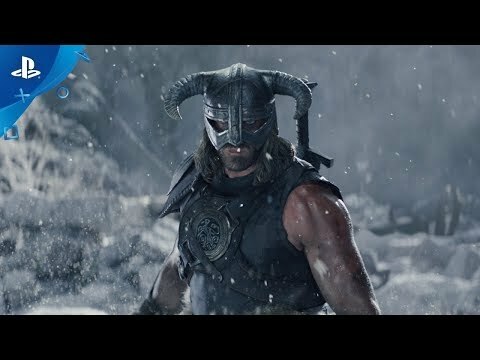 The Elder Scrolls V: Skyrim, winner of over 200 Game of the Year Awards, is reborn as Skyrim®VR, bringing to life a complete open world for you to experience any way you choose. ©The Elder Scrolls V: Skyrim® VR © 2011-2017 Bethesda Softworks LLC, a ZeniMax Media company. The Elder Scrolls, Skyrim, Bethesda, Bethesda Game Studios, Bethesda Softworks, ZeniMax and related logos are registered trademarks or trademarks of ZeniMax Media Inc. in the U.S. and/or other countries. All Rights Reserved. INSTRUCTION MANUAL. CAREFULLY FOLLOW ALL INSTRUCTIONS FOR SETUP AND USE. PlayStation®VR is not for use by children under the age of 12. Some people may experience motion sickness, nausea, disorientation, blurred vision or other discomfort while viewing virtual reality content. If you experience any of these symptoms, stop using immediately and remove the VR headset.